ColoVantage Home is based on the latest technology to detect hidden bleeding, which may indicate colorectal disease. ​First released in 2000, ColoVantage Home is a faecal immunochemical test (FIT) that has since been used to screen millions of people around the world. The test detects blood in the stool/faeces (which is often hidden) that may be an early symptom of serious colorectal diseases. The patented ‘Brush’ sampling technology is used to test the water in your toilet bowl for hidden blood. The test is easy and convenient to use – and, unlike other tests, involves no faecal handling. The advanced chemistry of ColoVantage Home is specific for ‘lower gastrointestinal’ bleeding. The test does not require changes to diet or medications. 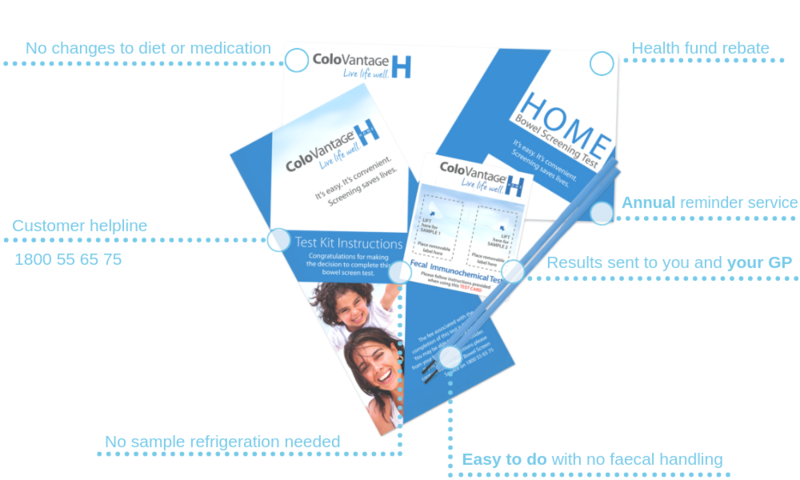 The ColoVantage Home ‘Test Card’ uses patented technology to store your sample in the most stable, dry-format for transportation to the lab for testing. At home, the user collects two samples of toilet bowel water that are stored and protected on the patented Test Card. The sample is then simply posted through the mail (postage paid envelope provided) to the lab for processing. In the lab, the Test Card is investigated using a sophisticated ‘immunoassay’ to look for the presence of human blood in the sample. If the test is ‘positive’ this means that blood was detected and your doctor may request that you undergo further medical testing to look for the source of the bleeding. Often, this further testing involves having a colonoscopy to inspect the inside lining of your lower gastrointestinal (GI) tract. Life is for living, loving and laughing, so it stands to reason you’d do everything you can to keep yourself healthy. Congratulations for making the decision to complete this bowel screen test. You need only two samples of toilet water taken from around your stool on two separate occasions.The good news is there is no faecal handling and you don’t have to scoop any solid matter. Using the brush provided lightly brush the surface of the stool and water around the stool and paint it onto the Test Card. If you still have questions, please call 1800 55 65 75. Clinical studies have proven that ColoVantage® Home is highly accurate for detecting even tiny or invisible amounts of blood in your sample. Clinicians will understand that the ColoVantage® Home test has a very high sensitivity (88%) and an exceptional specificity (to reduce false positives) (96–98%). The convenient, easy-to-use patented brush collection method has been shown to improve participation with screening by up to 66%. As always, if you see blood in the toilet bowl or suspect a medical problem, please speak with your doctor immediately. What does a positive or negative test mean? This test detects human blood on or in your stool. There are many gastrointestinal conditions that may cause blood in your stool. If you receive a ‘positive’ test result, more testing and evaluation by a doctor is necessary. This additional testing and evaluation may include diagnostic tests that could help your doctor understand the cause of blood in your stool. A ‘negative’ test result means that no human blood was found in the samples. Many bowel conditions do not bleed all the time and a faecal immunochemical test may not detect blood even if a condition is present. The Gastroenterological Society of Australia recommends that healthy adults aged 50 years and older screen every one to two years using a faecal immunochemical test (FIT). This test is not a replacement for a regular physical examination by your doctor. If you have any questions about your bowel health you should see your doctor. What does the ColoVantage Home test include? an annual renewal reminder service 12 months after your test. ​Can you tell me about the test? There are no dietary or medicinal restrictions. You do not need to go off any foods or medicines. There is no faecal handling – you do not need to scoop any solid matter. There are only two samples of the toilet water from around the stool. Lightly brush surface of stool and water immediately round the stool. Test samples are simply posted in for analysis. Two result letters notifications are forwarded directly to you and also to your doctor. The total cost is $39.95. I am with a health insurance fund. Can I claim this back? Yes – to claim a refund you will need a receipt. I have a DVA gold card. Can I get the test for free? We currently do not have an arrangement with the Department of Veterans’ Affairs. Please make payment of $39.95 for the test and request a receipt on your information form. You can take this receipt to the DVA to claim. I am over 50 and a pensioner. Can I get a free test? No, we do charge a fee for our service. It is the same price for everybody. Why do I have to pay? I just turned 50 and I heard this test was free. 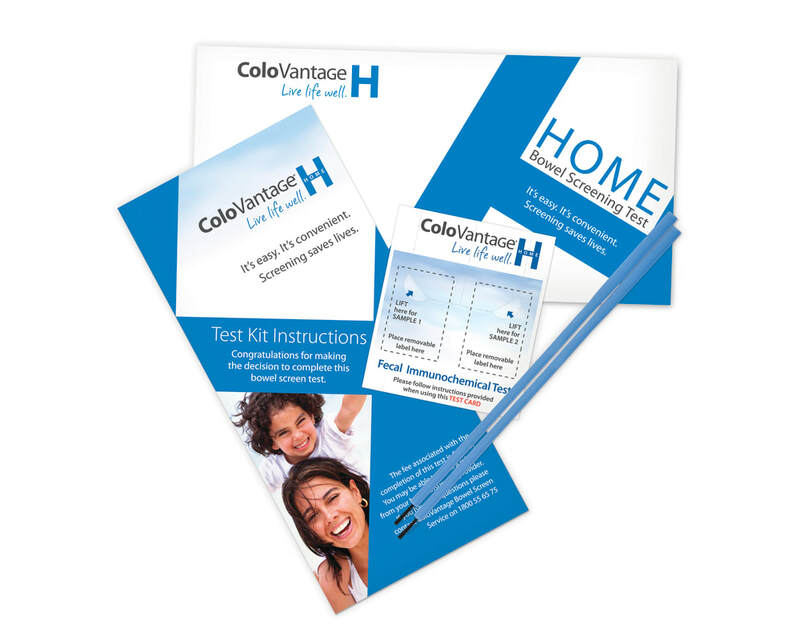 The ColoVantage® Home test is not free. ​The National Bowel Cancer Screening Program offer testing to people turning specific ages. Please call the National Screening Program Helpline: 1800 118 868. What if I need a new test? How can I order a ColoVantage® Home kit? ​I have completed my test incorrectly. Can I get another one? Yes, you can ring our customer service toll-free number on 1800 55 65 75 or send us an email info@clinicalgenomics.com. How often should I do this test? The Gastroenterological Society of Australia recommends screening every one to two years for people over the age of 50. Please consult your doctor. You have sent me a test but I don’t want to do it this year. Can I send it back? Please hold on to it and use it next year. Check the expiry date printed on the back of the test card prior to using it. Unfortunately we cannot take the kit back so you can hold onto it or give it to someone else or dispose of it. How soon can I expect a result? The results will be mailed to you and your nominated doctor if you received the test from your doctor. We get results out in less than 21 business days from the time your test arrives in our lab. Yes. Clinical studies have proven that ColoVantage® Home is highly accurate for detecting even tiny or invisible amounts of blood in your sample.